Shure may not have quite the profile it once did in the cartridge world, but it maintains a modest range of both hi-fi and DJ models: the M97xE is the flagship among the former. It includes several features reminiscent of the famous V15 series, most obviously the ‘Dynamic Stabiliser’, a small carbon-fibre brush which rests on the disc during play and, thanks to its damped hinge, provides improved tracking of badly warped records and much reduced subsonic rumble from all discs. You don’t have to use it, as it slips safely out of the way. The other major link with past Shures is the high compliance of the suspension. This may seem a trivial matter, impacting solely on the arm/cartridge resonance which is inevitable but not necessarily critical, but high compliance means the cartridge will track heavily modulated records better at a low tracking force. This in turn means less frictional drag between stylus and groove and hence less localised heating, which is considered to be the main cause of disc and stylus wear. In addition, high compliance means less reaction on the arm, lowering the impact of the arm’s ‘sound’. The stylus in the M97xE is elliptical, mounted in a thin-wall aluminium cantilever. A metal mounting plate is used with semi-circular holes. 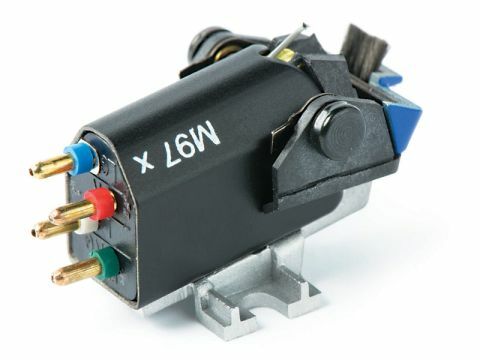 With or without the Dynamic Stabiliser, this is an exceptionally detailed and sweet-sounding cartridge. It has very good bass, deep and lively, but never overstated and particularly fine midrange, which presents a fantastic amount of information without ever losing the essential melodic thread and flow of a piece of music. Treble is very good too, though it lacks the last degree of finesse that fancier stylus profiles can bring.